Mike is a paralympic snowboarder who was diagnosed with Type 1 diabetes a year after being in an accident that claimed his leg. He is an amazing young man who dedicates a lot of his time to sharing his story and inspiring children and adults living with Type 1 diabetes. Mike has a dream. He wants to dance with Ellen DeGeneres on the Ellen show! In the blog post above are links to the show. Ideally we would LOVE to see Mike on the show in November. Not only is he a great dancer, he is a wonderful ambassador for people living with Type 1 diabetes. Please help me to help him make his dream come true! Pass the link around, the story, create your own story, go onto the Ellen site and let’s get Mike groovin’ on Ellen this fall!!! 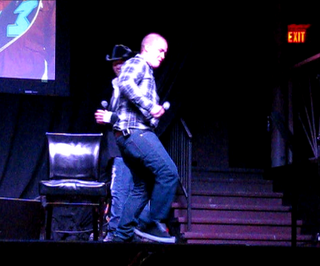 Mike busts a move. . .